Fifteen years ago, Susan Allison-Hatch heard a colleague say, "We've decided to go ahead and build our new House of Worship. And we've decided to do so with love". The following Sunday Susan accompanied her colleague to St. Michael's. A few months later, she joined the New Members Class. On Palm Sunday that year, she was confirmed with the first group of people confirmed in the new House of Worship. Yet it was in the silence of contemplative prayer (a practice she adopted at St. Michael's) that Susan was able to hear a call to ordained ministry that had been stirring in her since childhood. Three years after she was confirmed, Susan left the community and land she loved to attend seminary and pursue ordination as a priest in the Episcopal Church. 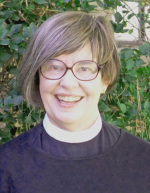 After seminary and ordination, Susan served as Associate Rector and Chaplain at an inner-city church and school in Oakland, California. There her passion for ministry with those who fall outside the walls of church was kindled. She led a weekly service for kids and kids at heart; she served as chaplain in the emergency room of an inner city trauma center; and she forged a weekly inter-faith worship service in an Episcopal School for children of all faiths. Prior to returning to New Mexico, Susan served an ex-urban parish wrestling with the challenge of an aging congregation. She also began ministering to the homeless in San Francisco. In May, 2010, Susan and her husband Tim returned to New Mexico to purchase a house and to resume life in the land they had come to love and call home. When Susan is not at St. Michael's, you'll find her at St. Martin's Hospitality Center, a day shelter for people experiencing homelessness, or in the pool or on her bike or at her sewing machine making a quilt. Susan holds dear two vows she has taken—her marriage vow to Tim and her priestly vows. Throughout her journey, Tim has been a stalwart and wise companion. For that she is grateful. Click the button to go to Rev. Susan's weekly Live at Five blog! Click on the button for an archive of Susan's Live at Five sermons!